The Cri-Cri is the smallest twin-engined manned aircraft in the world and is constructed by gluing aluminum sheet to foam. The HobbyKing Cri-Cri model is also made of foam, but of the durable EPO variety. A steerable nosewheel gives the Cri-Cri good ground handling, while the counter-rotating propellers minimize any torque effect on take off. 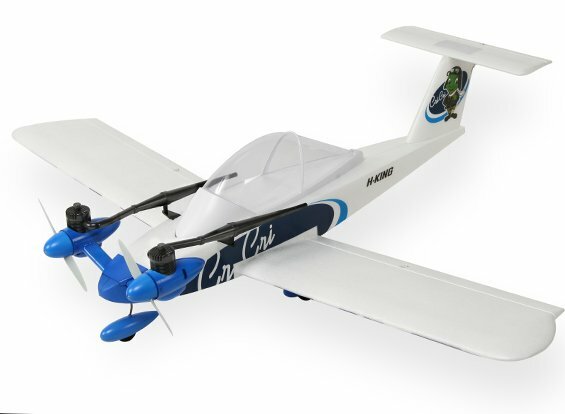 Though the Cri Cri features faux glow engines and tuned pipes, this twin uses counter-rotating props that are spun by brushless electric motors. Items required for completion include a four channel radio system and a 3S 1300-1500mAh LiPo battery. Available from all HobbyKing warehouses.